I was overjoyed that it finally rained last night! First thing in the morning I scurried outside to see how my garden was doing. 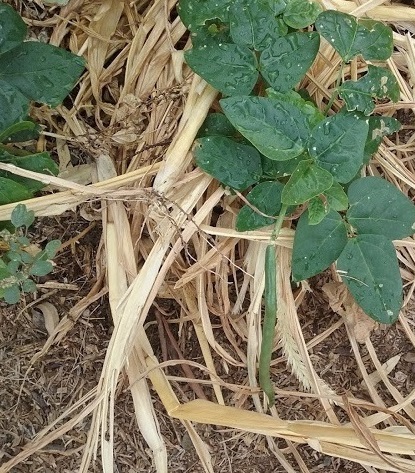 The cowpeas were thriving, snug in their bed of pala verde mulch and some fallen corn stalks. One still had a flower! 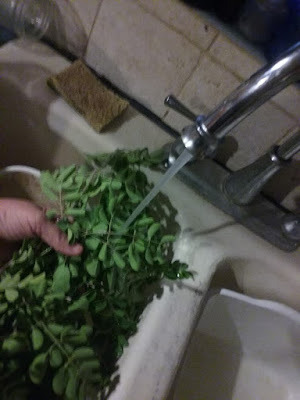 The tomato plant seemed to enjoy the fresh rainwater. 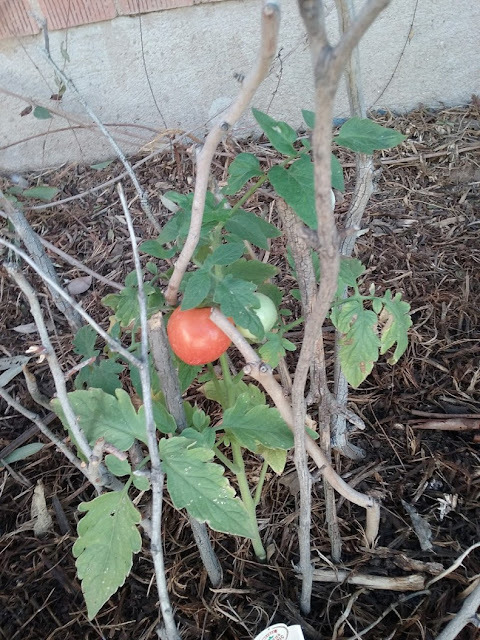 With a little help from some mulch to keep the ground consistently moist, the tomato had gone from orange to red overnight. When we first started this garden we used some stinky compost (not good), but I tended the soil with used coffee grounds and tea leaves until the soil is really rich and nice now. 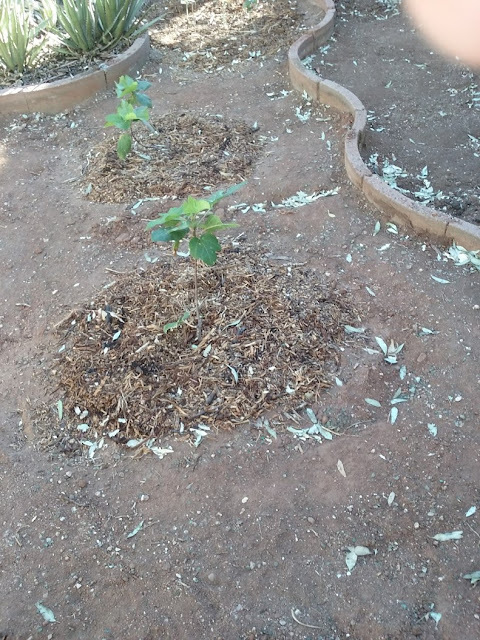 That, and palo verde mulch, is all we use in this kitchen garden. Tryin' to keep it native - to see if we can actually grow food with only what we have at our place. When I first went out, I got sticky mud on my feet from trekking through our backyard basin. By late morning the ground was already hard and dry. But the little mounds of mulch around the fig trees were holding the moisture nicely. A good reminder that we need to finish digging the basin and fill it with mulch! 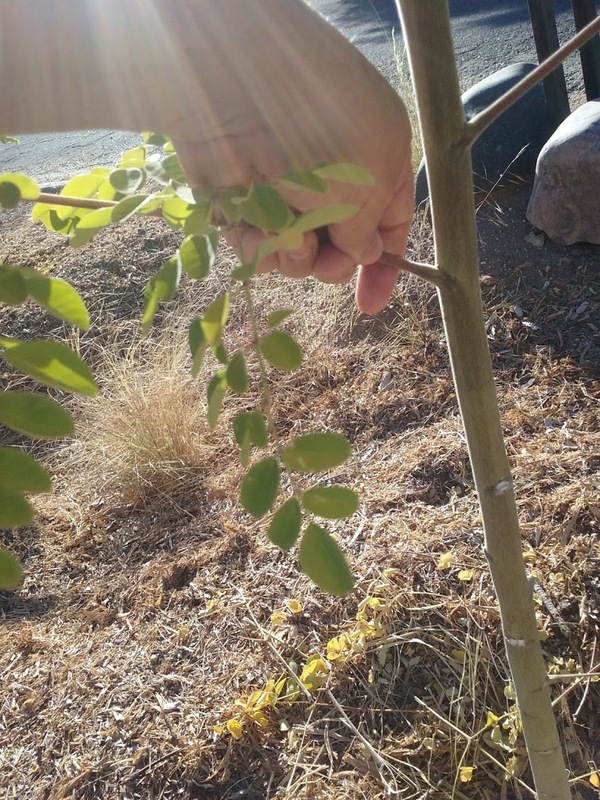 It wouldn't be morning without checking on the moringa in the catchment basin. 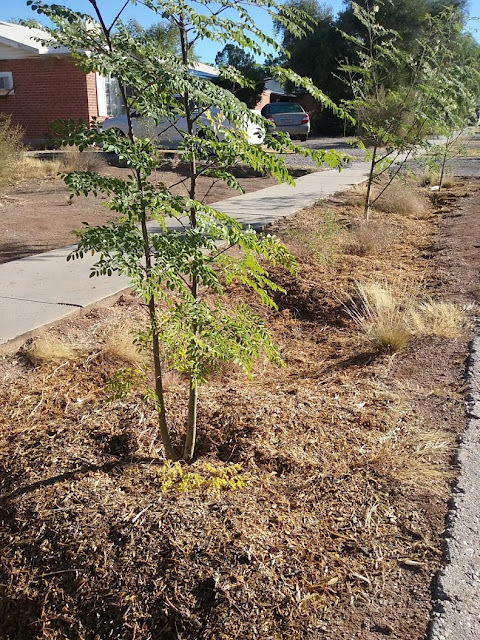 The pala verde mulch was thinning a bit, but along with the roots of the native grass and some moringa branches with yellowing leaves that I had "chopped and dropped," it was forming a nice sponge to hold the rainwater. I noticed that the mulch also prevented erosion from the rain. This little guy (can you spot him?) flittered by to enjoy the sweet moringa nectar. 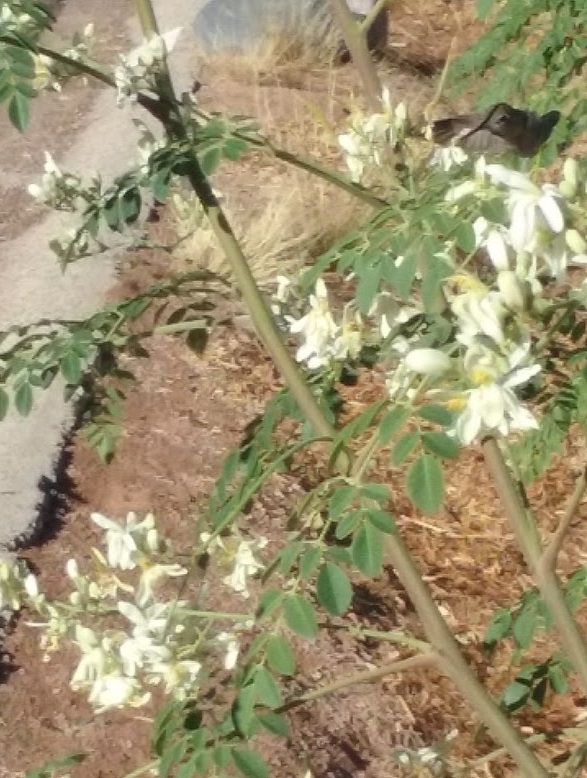 Our moringa is great at attracting pollinators of all kinds! I'd say that was worth celebrating! So I grabbed a branch. 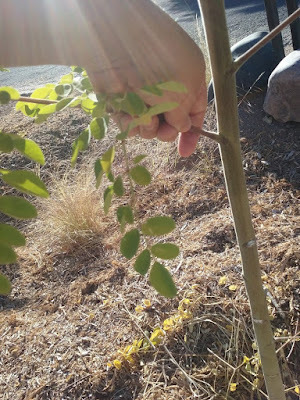 (They come off easily at the stem. 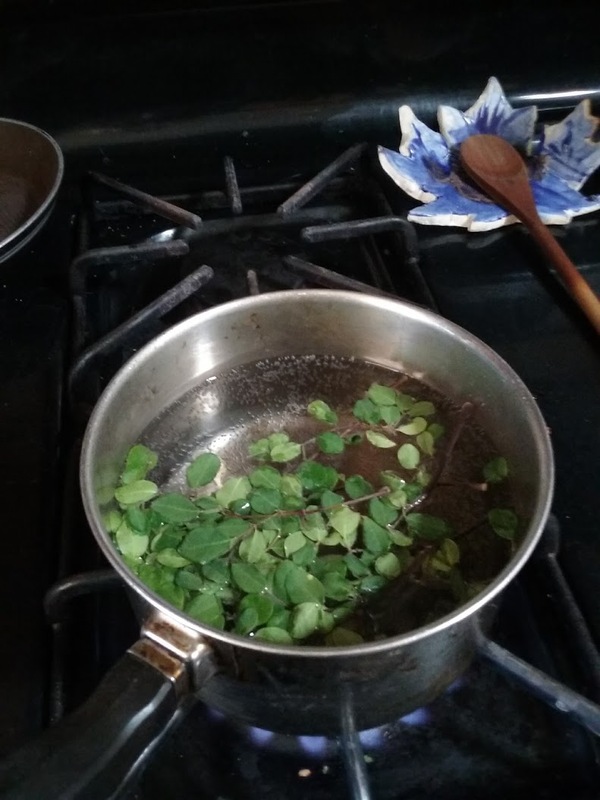 It's a very giving tree...) Thought I'd try my hand at making some moringa tea. Later that afternoon, I was so fatigued from working on desktop activist; I needed a nap. 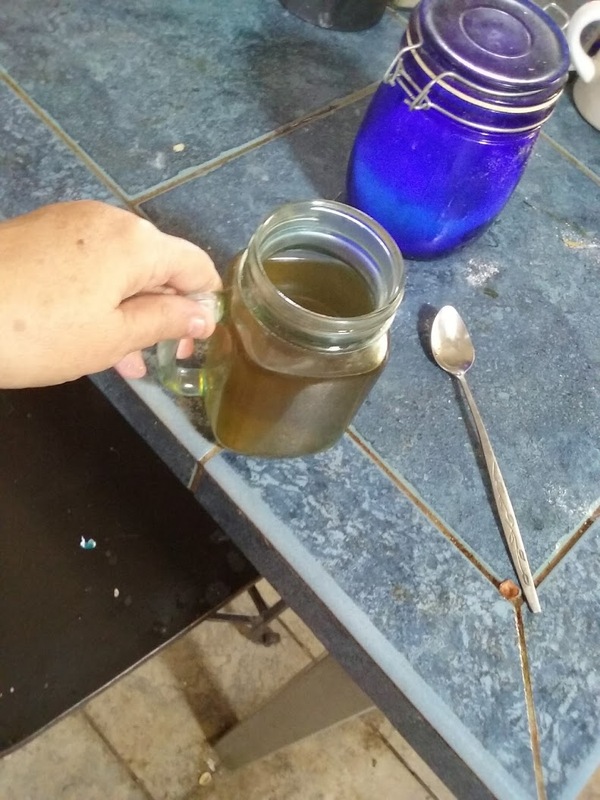 I drank one glass of moringa tea and was replenished immediately. 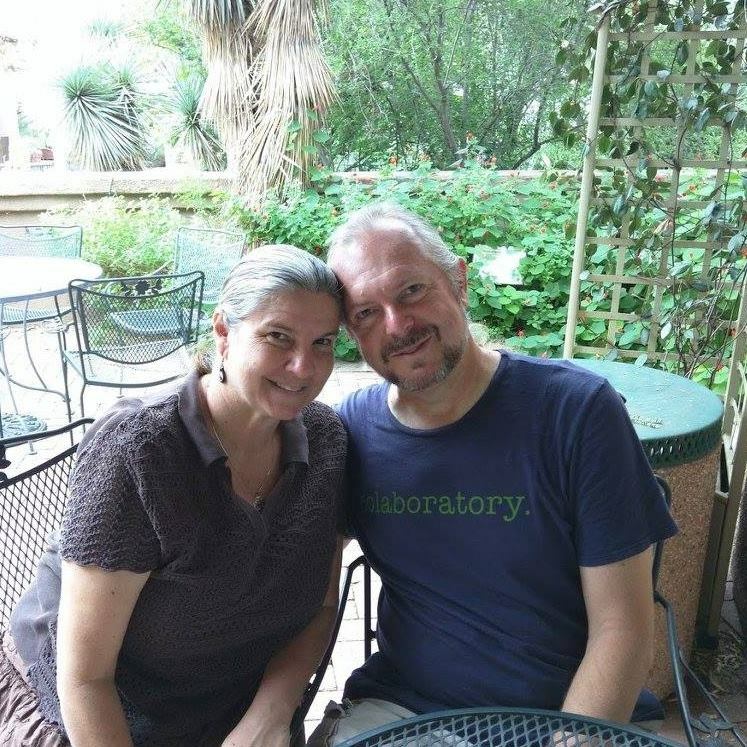 Even had enough energy to write this blog! 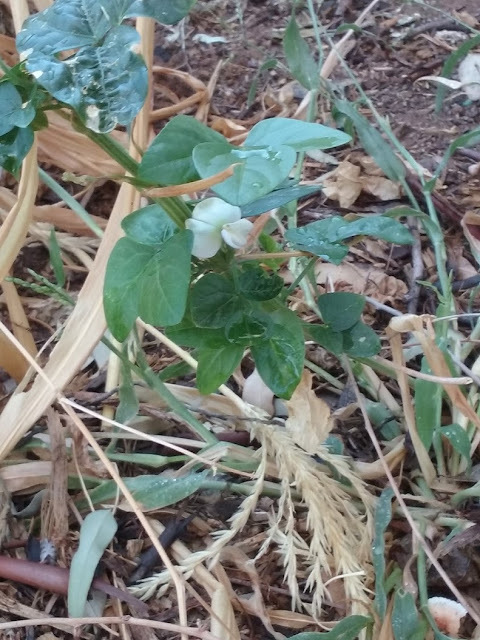 To autumn rain, muddy feet, mulchy gardens and miracle moringa! Cheers!